Nimble Storage recently advanced their Adaptive Flash Platform with the release of Fibre Channel protocol support for the CS-series storage arrays. This release marks a significant milestone for Nimble Storage as it enables them to effectively address storage requirements that are enterprise-wide as well as quadruple the amount of markets they can serve. Nimble Storage also announced the doubling of the maximum capacity of their storage systems to support up to 1.6PBs of raw capacity and 160TB of flash per cluster. Fibre Channel options are available for the CS300, CS500, and CS700 series arrays. The CS300 arrays offer 1 dual-port 16 GB FC NICs, the CS500 arrays offer 1 or 2 dual-port 16 GB FC NICs, and the CS700 arrays offer 2 or 3 dual-port 16 GB FC NICs. Each of these CS-series arrays also has the option for additional 1GbE, 10GbE SFP+, or 10GbaseT cards. So far, Nimble Storage has successfully completed 40 deployments as a part of their beta program to effectively test and validate the expanded protocol support in real environments. These tests revealed high levels of satisfaction including ease of deployment and the ability to consolidate a broad range of enterprise applications and workloads. Other results included radically better price-performance, reduced footprint, the convenience of managing multiple arrays as a single scale-out SAN, the dramatic simplicity of snapshot-based backups and replication for DR, as well as the benefits of InfoSight’s cloud-based support and management. This beta test was so successful that Nimble Storage released it a full quarter ahead of schedule. The addition of Fibre Channel to the Adaptive Flash platform has allowed Nimble Storage customers to speed up the transition from disk-centric to flash-centric architectures. Veeam has recently announced version 8 of its Veeam Availability Suite. With this release, Veeam defines Availability for the Modern Data Center by leveraging technologies including modern storage, virtualization, and the cloud. Veeam Availability Suite v8 combines the industry leading backup, restore, and replication capabilities of Veeam Backup and Replication with the advanced reporting, monitoring, and capacity planning functionality of Veeam ONE. Compatible with VMware and Microsoft Hyper-V environments, Veeam Availability Suite v8 delivers everything needed to protect and manage your virtual or cloud environment. High-Speed Recovery – Brand new Explorers for SQL Server and Active Directory and a new Veeam Explorer for Storage Snapshots for HP and Net App are now available along with v8’s already well-known recovery features such as Instant VM Recovery, Instant File-Recovery and Explorers for Microsoft Exchange and SharePoint. Data Loss Avoidance – Provides backup and replication, built-in WAN acceleration and native tape support as well as several new replication enhancements and updated Veeam Cloud Connect, End-to-End Encryption and more. Verified Protection – With the use of Veeam’s SureBackup and SureReplica technology, reliable restores, automatic backup testing and virtual labs ensure that backups are successful and are available whenever they are needed. Leveraged Data – Minimizing the risks associated with application deployment by automatically creating an isolated, easily accessible environment for application-item recovery, validating virtual machine backups and replicas and perform testing, training and troubleshooting. Complete visibility – Improved monitoring tools such as centralized management, vCloud Director integration and vSphere web client plug-in all provide complete visibility to the infrastructure. Veeam Availability Suite v8 is available now! In response to Lenovo’s acquisition of IBM’s x86 server business on October 1st, Great Lakes Computer has built a solid inventory of IBM System x3550 M4 and IBM System x3650 M4 rack servers as well as IBM BladeCenter HS23 blade servers. This strategic inventory position guarantees that our customers are provided with the availability of this product during this transitional period. This sale to Lenovo has interrupted the distribution channel for IBM’s x86 servers and is bringing uncertainty to those who are currently standardized on these platforms. With this increased inventory, Great Lakes Computer can now provide this hard-to-find equipment to better support those customers as a stable solution for sourcing this equipment. Taking this strategic inventory position on IBM x3650 M4, IBM x3550 M4, and IBM HS23 servers allows GLC to ease the difficulty and provide clarity during this process. By sourcing the chassis of each model, our configure-to-order process enables us to provide you with any configuration of processor, memory, and hard drive that you require. For further information and a list of the full IBM x86 server SKUs in stock, please see our latest press release. In early September, Dell unveiled its most advanced portfolio of PowerEdge servers to date with the 13th generation. The portfolio features customer-inspired engineering that is constructed to simply management and enhance workloads. Designed to address and optimize the ever-changing spectrum of application workload requirements and industry trends such as cloud computing, big data, mobility, and software- defined networking (SDN), the new Dell PowerEdge portfolio features new state-of-the-art advancements including increased storage, processing, and memory technology coupled with systems management capabilities. The first of the new next generation PowerEdge servers includes the PowerEdge R730xd, R730, and R630 rack servers, the T630 tower server, and the M630 blade server. Each of these PowerEdge servers run on the latest Intel Xeon E5-2600 v3 processor family and include Dell’s portfolio of enterprise infrastructure offerings, software, and service. As many challenges and pressures have been forced upon IT organizations that did not even exist a few years ago, it is important to find the perfect balance of implementing new technology without increasing complexity within any data center. To achieve this goal, the Dell PowerEdge portfolio focuses on three underlying principles: simplification of systems management, accelerating application performance, and empowering workloads in any environment. With increased operational efficiency and flexibility at any scale for the most demanding environments and applications, the new generation of PowerEdge servers are built to leverage modern storage technologies that are future-proof. New in-server storage technology provides industry-leading capabilities including accelerating the most important data, zone large datasets, and support software defined storage and optimized data placement. Dell’s new PowerEdge servers offer flexible platforms and innovative architectures that empower customers to modify systems to meet their exclusive workload and application requirements including unified communications, business computing, virtualization, collaboration, and technical computing. Today many IT departments are moving towards software-defined networking (SDN) in their data centers. SDN is an approach to computer networking where control is separated from the physical infrastructure and allows network administrators to manage network services and support a network fabric across multi-vendor equipment. As an emerging architecture that is manageable, adaptable, dynamic, and cost-effective, SDN is ideal for high-bandwidth and demanding applications. There are many trends driving IT administrators to this network change, including changing traffic patterns, the rise of big data and cloud services, increasing Bring Your Own Device (BYOD) trend, the inability to scale, and vendor dependence. There are many benefits of using software defined networking including flexibility in how the network can be used and operated, improved uptime through eliminating manual intervention, lowering operational costs, infrastructure savings, better planning with increased visibility into the network, and better management through Managed Service Providers (MSP). In a study published in August 2014 by Infonetics Research, titled Data Center and Enterprise SDN Hardware and Software Annual Market Size and Forecasts, the firm stated that it found that the enterprise and data center SDN market grew 192 percent in 2013 and is expected to reach $18 billion by the year 2018. Up from 2012, the in-use SDN Ethernet switch revenue, including bare metal switches, branded Ethernet switches and virtual switches, grew ten-fold. This increase was found to be a result of the increases in white-box bare metal switch deployments by large cloud service providers such as Amazon and Google. At the top of the in-use SDN-capable switch in the data center is the bare metal switch, which is expected to account for 31 percent of the total SDN-capable switch revenue by the year 2018. Infonetics Research also predicts that leaders in the SDN market will emerge during the upcoming years as lab trials transfer into live production deployments. In the meantime, the transition of SDN network virtualization overlays is predicted to reach mainstream buy 2018. To conduct this study Infonetics Research gathered data by tracking SDN controllers and Ethernet switches in-use as well as SDN-capable Ethernet switches. IBM launched a new line of System x M5 generation servers in early September despite the sale of the x86 server line to Lenovo. On October 1st, Lenovo announced that they have completed the initial closing for the acquisition of the IBM x86 server business. This series is likely to be the last release of x86 servers by IBM before the purchase goes through. The new line of IBM M5 x86 servers is designed to support a wide range of computing environments and enterprise workloads and contains features that make it secure, efficient, and reliable. With this release, IBM hopes to expand the x86 server use case with features unique to the new M5 line including IBM Trusted Platform Assurance security features, energy-saving TruDDR4 memory, and new Intel Xeon E5-2600 v3 processors. Other features of the new M5 x86 server line include added hardware support for the Trusted Platform Module (TPM 2.0) that will enable more encryption algorithms and Windows support, and a new Secure Firmware Rollback feature that will prevent unauthorized updates of previous firmware versions. Improved energy efficiency is also prevalent in the IBM x86 servers with new features including dual fan zones, standby mode for power supplies, and extended operating temperature ranges. The new M5 servers provide up to 131% performance improvements over previous generations for faster analytics and improved business decision-making capabilities. Each M5 server can come loaded with up to 1.5TB of memory and range from 1U to 5U in form factor height. The M5 platform comes in configurable models of tower and rack servers, dense systems, blades and integrated systems. System x servers continue to have the highest availability of all x86-based servers which is a crucial factor for business that cannot afford downtime. IBM remains the second-largest holder of the global server market despite its decision to leave the x86 server business. IBM continues to strike success from selling fewer big ticket items than selling many commodity x86 servers, which explains its reasoning for walking away from its x86 line to focus on other areas. Lenovo will now begin the transition in countries that are a part of the initial closing which includes most major markets. The transaction is expected to close in most other countries later this year with the full acquirement in all countries by early 2015. Juniper Networks has enhanced the capabilities of the Spotlight Secure threat intelligence platform by integrating the ability to link with firewall policies in Juniper Networks SRX Series Services Gateways. This enhancement is one more way that Juniper Networks is working to provide additional layers of defense in the effort to stop advanced malware and emerging threats. With this new capability, administrators and security professionals can quickly take action on data from verified threat detection feeds and enhance the protection of their high-IQ networks. As threats continue to increase, accelerate, and evolve, security continues to react with many new technologies. With a vast selection of security tools on the market, customers are still struggling to manage mismatched security tools. As a result, gaps are left between enforcement and detection at the firewall. Juniper’s revamp of the Spotlight Secure platform addresses these issues and provides administrators with new benefits not found in any other platform. Highlights of the new enhancements include an intelligent firewall, tight integration with the network, and advanced threat protection. Advances to the SRX firewall now allow it to consume and enforce policy based on the aggregated threat intelligence from detection technology and feeds that are located in the cloud and on premises. Cloud-based threat feeds and customer firewalls are now linked via Juniper Networks Junos Space Security Director and Spotlight Secure as they provide a sole aggregation point for many feeds into the firewall. New threat feeds for Spotlight Secure provide C&C and GeoIP feeds that adapt protection and firewall policies based on the severity of threats in the network. These features also allow the firewall to identify and block traffic from indicated countries and /or send their traffic through added security services. Spotlight Secure integrated with the SRX firewall brings new capabilities that allow users to effectively take on threats within their network. With an open and scalable security platform, users can now achieve diverse threat intelligence and detection to provide timely, actionable enforcement on the firewall that can stop a wide range of threats. Increased security effectiveness provides users with the ability to use and employ industry-leading technologies, delivering real-time integration between threat feeds and the firewall. With the Spotlight Secure simplified enforcement model, users can significantly reduce administration costs. Centralized management brings threat intelligence feeds, reporting, and more, available in a single pane view with Security Director, while the latest aggregated threat intelligence can automatically syndicate across the entire firewall. In today’s data centers, conventional storage systems are overwhelmed as a result of huge data volumes and complex solutions. With a new approach to storage, VMware Virtual SAN is a new software-defined storage tier for VMware vSphere that clusters server-side disks and flash to create simple, high performance, flash-optimized shared storage that is designed for virtual machines. As hypervisor-converged storage software, Virtual SAN is embedded in the vSphere kernel, which allows optimal data placement and I/O optimizations. With this unique characteristic, Virtual SAN makes integration with vSphere seamless and provides the highest levels of performance, scalability and resilience. With the flexibility to build customized storage systems in heterogeneous hardware environments, Virtual SAN can be deployed on hardware from any server manufacturer. Storage management is made simple because Virtual SAN is integrated with the vSphere Web Client. This integration allows for simple management of both storage and compute through a single interface. 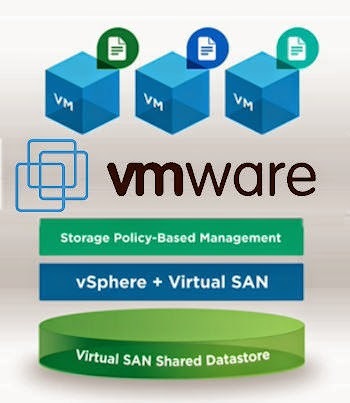 At the core of VMware Virtual SAN is policy-based provisioning. 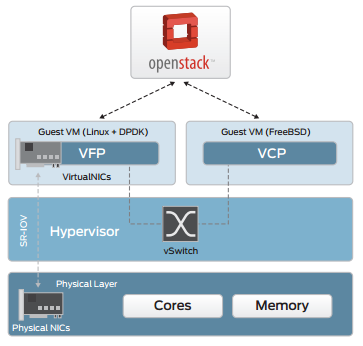 Policies are created and assigned to a VM and Virtual SAN handles the rest. As workloads shift, policy adjustments are made simple and allow users to make the policies while Virtual SAN adjusts them without interrupting service. When there is a need to expand capacity or performance, hosts can be added to a cluster or disks can be added to a host. VMware Virtual SAN also has no LUNs or RAID configurations while removing the need for manual adjustments by automating time-consuming tasks. VMware Virtual SAN works seamlessly with the entire VMware stack and leverages VMware snapshots, VM clones, VMware vSphere Data Protection, and vSphere Replication for data protection, backup, rapid cloning, and disaster recovery. With built-in fault tolerance, Virtual SAN supports a failures-to-tolerate setting on a per-VM or per-policy basis allowing for granular protection of important data by distributed copies across vSphere hosts. There are many benefits of VMware Virtual SAN including the fact that it is the first policy-driven storage product that simplifies how storage in managed. High performance is achieved through the use of server-side flash technology which enables true server-side read/write caching. With the use of enterprise-grade HDDs and SSDs to create a converged and resilient SAN-like storage tier within the hypervisor, Virtual SAN lowers the Total Cost of Operation (TCO) by up to 50 percent over virtual storage appliances and mid-range hybrid arrays. Virtual SAN also allows users to make a low upfront investment and grow the aspects of storage that their environment requires over time. Recently, Nimble Storage released a new technology they call their Adaptive Flash platform. This technology combines Nimble’s existing, patented Cache Accelerated Sequential Layout (CASL) architecture and their cloud-based InfoSight storage lifecycle management platform. The combination of these two features enables storage resources to be intelligently and dynamically deployed to better support a wide range of mixed data center workloads. Nimble’s Adaptive Flash platform incorporates both SSDs (solid-state drives) and HDDs (hard disk drives) and is engineered to allow enterprises to add flash incrementally as they need it. The new CS700 series model offers more flash capacity than the CS200 and CS400 series with increased maximum flash capacity in the head unit as well as maximum flash capacity with the new All-Flash Shelf. The new All-Flash Shelf is an add-on component to the CS-series systems that can accommodate up to 12.8TB of SSDs. The Nimble Storage CS200 Series supports workloads such as Virtual Desktop Infrastructure (VDI), Microsoft applications, and virtual server consolidation. It is ideal for medium sized IT organizations or distributed sites of larger enterprises. The Nimble Storage CS400 Series is ideal for IO-intensive workloads including large-scale VDI, SQL or Oracle server databases and offers advanced performance for large-scale deployments. Ideal for midsize IT organizations or distributed sites of larger organizations, the CS300 Array is a 3U dual controller hybrid flash system that offers the best capacity per dollar amount for workloads including VDI and virtual server consolidation. Offering advanced performance for large-scale deployments or I/O-intensive workloads such as large-scale VDI, and Oracle or SQL Server databases, the Nimble Storage CS500 array delivers the best performance and IOPS per dollar amount. The new CS700 series arrays are targeted towards enterprise-class customers with the ability to create a four-node, scale-out CS700 cluster that delivers an aggregate of 500,000 I/O operations per second and 1 PB of capacity. The CS700 utilizes Intel Ivy Bridge processors for around 125,000 IOPS, up to 2.5x the CS400 arrays. VMware, a strategic partner of Nimble Storage, said it is combining Nimble’s Adaptive Flash technology with their Horizon 6 virtual desktop suite that was rolled out in April. The All Flash Shelf (AFS) comes in the same 3U enclosure as the CS700 base unit, but can also be used with Nimble’s CS400 series arrays. These all-flash expansion shelves deliver up to 12.8 TB of SSD capacity and provides the CS700 with a maximum flash storage capacity of 16 TB when it is combined with the CS700’s 3.2 TB of flash. Each controller unit can also have an AFS to expand the default 4 SSDs for the flash pool. The AFS provides solid-state drive (SSD) capacity behind a Nimble Storage CS700 or CS400 hybrid arrays. The power requirement for the AFS is 200W, which is considerably less than other expansion shelves. Both the CS700 and the AFS are now generally available. HP recently announced a new addition to its HP ProLiant server portfolio with the release of Generation 9 (Gen9) servers. The HP ProLiant Gen9 servers will allow users to reduce complexity and cost while accelerating IT service delivery to promote business growth. This release of the new server line furthers HP’s vision for compute, the future of data center technology with the Gen9’s new technology features and workload-optimized design. The new Gen9 systems include blade, rackmount, tower, and scale-out architectures. HP has said that ProLiant Gen9 servers will launch in waves between now and June 2015. The new ProLiant Gen9 server line is designed to address challenges such as the ability to deliver more services, applications, and storage while reducing costs by providing flexible, scalable computing resources that are tailored to users’ business goals. Optimized for convergence, cloud, and software-defined environments, the HP ProLiant Gen9 server line features many new innovations. Some of these features include converged management across servers, networking, and storage to provide a software defined enterprise as well as HP-unique PCIe accelerators and HP DDR4 SmartMemory to increase compute capacity. Other innovative technology features include quick setup, monitoring, and firmware maintenance with secure embedded management including RESTful APIs and UEFI for hybrid cloud environments and increased performance with HP SmartCache and HP FlexFabric adapters. HP Gen9 servers are designed to run modern workloads that provide organizations with new capabilities. By deploying ProLiant Gen9 servers, businesses will be able to triple compute capacity and increase efficiency across many workloads at a lower TCO with design automation and optimization. The workload performance of applications that are business-critical will also improve by up to four times to accelerate business growth through memory, networking, and HP storage advances. For more information please visit www.hp.com/go/ComputeEra. For over a decade, Juniper Networks’ DDoS Secure technology has been ensuring availability of critical business resources for public sector, e-commerce, and financial customers, protecting applications against volumetric flood and application layer distributed denial of service (DDoS) attacks. DDoS Secure utilizes advanced heuristic DDoS mitigation technology that dramatically responds to over-loading of the protected resources, automatically providing the full spectrum of DDoS defenses to detect and block attacks. Today, DDoS Secure is the most comprehensive DDoS mitigation solution that is available, delivering protection against multi-vector DDoS attacks before they disrupt applications. Recently, Juniper announced improvements to its DDoS Secure solution that help companies more efficiently and effectively mitigate complex attacks by leveraging security intelligence throughout the network fabric, bringing them one step closer to building a High-IQ Network. The goal is to deliver tighter integration into routing and service provider infrastructures with BGP Flowspec and GPRS Tunneling Protocol (GTP) protocols to enable new forms of protection that can mitigate a variety of DDoS attacks without restricting or impacting normal service. These new enhancements allow attacks detected by DDoS Secure at the network and application-layer to be stopped closer to the source through networking protocols to make the Juniper MX Series routers function as enforcement points. Some highlights of Juniper’s announcement for upstream attack mitigation include distributed enforcement at the network boundary to protect the edge equipment as well as the resources behind it from becoming overwhelmed, especially when large or more challenging volumetric attacks take place. Also, the use of Flowspec provides the ability to take enforcement actions such as source-based black hole filtering to drop malicious packets or redirecting traffic to select network points for mitigation. Accurate enforcement on mobile networks with GTP network protocol unwrap include new capabilities that protect against the escalating issue that service providers face in detecting and mitigating malicious traffic originating from botnets exploiting users’ devices. Also, DDoS Secure now also provides a look into malicious and errant mobile devices by identifying both User Equipment (UE) to UE and UE to Internet traffic. For DNS inside-out attack protection, DDoS Secure now protects the core DNS infrastructure from participating in DNS amplification and reflection attacks that are difficult to detect and can have disastrous effects on network availability. DDoS Secure also applies heuristics-based intelligence to automatically mitigate attacks by rate limiting and black listing certain DNS requests. Also, this can generate a BGP Flowspec rule that allows attack traffic to be blocked upstream at the MX. From a security standpoint, most businesses are completely REACTIVE. They don’t take action or implement protective measures until they experience a compelling event. When a DDoS attack does occur, not only does the business lose money, but also the trust and reputation of its employees and customers. DDoS Secure is necessary for all business to implement into their data centers as these types of attacks continue to increase each year. Days before VMworld 2014, VMware announced the rebranding of its vCloud Hybrid Service to vCloud Air. This name change was made to highlight and focus the company’s commitment to the hybrid cloud category and emphasize their belief that the hybrid cloud is the future of professional deployments. VMware vCloud Air is built on the foundation of vSphere, is compatible with any on-premises data center, and allows users to simply extend their workloads into the cloud. Users can migrate existing virtual machines (VMs) from on premise private clouds to the public cloud or deploy new applications directly in the cloud, creating a seamless hybrid cloud. vCloud Air reduces the risk and cost of ownership by offering automated replication and monitoring without requiring any modifications to existing applications. Delivering the reliability, performance, and security users demand from a hybrid cloud platform, vCloud Air provides only one support call for on-and-off-premises clouds. Some benefits of using vCloud Air include its compatibility, agility, and ease of use. With support for over 90 operating systems and more than 5000 applications, vCloud Air has support delivers reliable and secure service that users expect from VMware while leveraging existing investments, processes, and expertise, as well as familiar tools and services that make moving to the cloud simple. The agility of vCloud Air empowers users to do more in less time. Users can set up, tear down, deploy, and test without the need to build a new infrastructure, as well as provides room for future growth. vCloud Air is easy to use and allows users to understand and plan their budgets through a capacity-based subscription, as well as employ existing policies in the cloud and rely on the same source of support as the onsite data center. Develop/Test – A first step into the hybrid cloud allows users to free up on premise resources by running pre-production in the cloud and choosing to deploy on or off-site. New Enterprise Applications – Using the hybrid cloud, users can host and build new applications in traditional architectures (Java). Disaster Recovery – vCloud Air provides a reliable failover environment. Packaged Applications – Allows users to use their next application upgrade cycle of existing virtualized desktops and applications and host in hybrid cloud. Next Generation Applications – Move from traditional to next generation and mobile applications and test, develop and deploy in hybrid cloud with advanced tools. To learn more about VMware vCloud Air please visit http://vcloud.vmware.com/service-offering/what-is-vcloud-air. The traditional firewall continues to be a staple in the network for security activities. Firewalls have traditionally operated on Layer 3 and Layer 4 information. In more recent years, they have become a lot smarter, which is in part due to Layer 7 Application identification and enhanced deep packet scanning. With these enhancements, firewalls began to gain new abilities including the ability to control applications and the capability to understand and identify the applications that are running in a network, allowing new application layer controls to be put into place. Next generation firewalls can also reach out to an organization’s directory services, i.e. Active Directory or eDirectory, and pull in user information for setting up user firewall policies, allowing for user and/or group-based application controls. Referred to as Next Generation Firewalls (NGFW), additional NGFW enhancements include the ability to provide deep packet scanning, content security, gateway anti-virus, and content filtering. Next generation firewalls give you the control, protection, and simplicity, along with the operational efficiency to support your business. It is important to maintain a balance between three main areas: operational efficiency, support for the business, and security efficiency. Operational efficiency allows users to scale centralized control and protection of resources. NGFW’s provide support for businesses by being open and flexible with better total cost of operations (TCO). They also offer security efficiency that protects with breadth, depth, and enhanced threat prevention. Bulk adoptions of next generation firewalls are starting now, and Gartner estimates that 70% of enterprise firewall purchases in 2014 will be next-gen firewalls. Application awareness is the core of next generation firewalls. Application awareness enables firewalls to identify the applications that are running across it. Applications aren’t always easily recognized as some are evasive, but once identified there are a number of capabilities that are opened for use. In the beginning, visibility and tracking allow administrators to understand what applications are running across the network while gaining an understanding of what kind of security risks you might be looking at as well as what user behaviors are in play. Application identification allows users to control and set policies based on those applications. It gives you the capability to block applications you might consider risky such as peer to peer applications. User firewall controls allow different users to have different application policies based on their role and group. Policies can also be tailored by specific applications and rate limits can also be placed on individual applications, providing a nice level of control. Quality of Service (QoS) can be applied on policies that help protect and optimize the use of your resources and prioritize the applications that are mission-critical while limiting the resources that are available for applications that are less important. Packet inspection can be used with encrypted packets and can monitor traffic traveling over https, which is important to be able to see what is in that traffic with SSL proxy. Intrusion prevention system (IPS) helps to remediate security threats and apply security controls. Unified threat management (UTM) is where content security comes into play. UTM provides antivirus, protection from malware, and reputation enhanced capabilities. Antispam provides multilayered spam protection and protection against APTs. Web filtering blocks malicious URLs and prevents lost productivity, while content filtering filters out extraneous or malicious content to maintain bandwidth for essential traffic. Juniper Networks’ takes a threefold approach to NGFW by providing security, easy manageability, and scalability for all-in-one best value devices along with software that provides consolidated, layered NGFW security. Services provide integrated solutions, ApplD efficacy, and threat/app support full portfolio, while simplified management delivers UX leads engineering, highly scalable integrating management for all of the security services into a single centralized management platform that enables management of multiple firewalls in one place. Open/dynamic intelligent security provides open IPS and app signatures, as well as advanced threat protection. Juniper’s NGFW capabilities include integrated user/role firewall that allows easy agent-less SRX AD integration, creating a flexible and scalable user FQ portfolio. AppSecure and UTM deliver better application (app) visibility and control including evasive app and tunneled app detection, open app and IPS signatures, and best-in-class content security. Simplified management features include centralized management of the complete security services suite, integrated logging and reporting, and the ability to scale to large environments. Juniper WebApp Secure delivers what you would expect an application aware solution to deliver, including tracking, firewall controls, QoS controls, SSL Proxy capabilities, and IPS. Integrated user firewall and extended user security options include integrated user firewall, active user role firewall SRX + MAG, and end-to-end user security SRX + UAC + NAC. All of these services are available on all of Juniper’s platforms, allowing users to choose a platform that best fits their environment and layer on security services as you need them. Licenses can also be purchased on an as-needed basis. Each device can be easily managed with Security Director. Juniper’s Firefly device also offers a virtual platform solution comes with AppSecure capabilities and UTM. When evaluating your NGFW, it’s important to remember that when adding additional services onto your firewall, you must consider the performance implications of those features or the resources that are in your firewall to make sure it can handle the added services. Great Lakes Computer has become a PartnerEdge authorized partner with Aruba Networks, a leading provider of next-generation network access solutions for the mobile enterprise. Founded in 2002, Aruba designs and delivers Mobility-Defined Networks that empower IT departments and #GenMobile, a new generation of tech-savvy users that rely on mobile devices for every aspect of work and personal communication. To create a mobility experience that #GenMobile and IT can rely on, Aruba Mobility-Defined Networks automate infrastructure-wide performance optimization and trigger security actions that used to require manual IT intervention. The results are dramatically improved productivity and lower operational costs. Aruba is the industry leader in 802.11ac access points and focuses on building secure, reliable, and easy-to-manage wireless networks. Recently Juniper Networks and Aruba Networks announced their strategic partnership to deliver converged wireless and wired networking solutions based on each company’s best-of-breed technologies. This partnership includes joint development efforts and collaboration to focus on items such as delivering comprehensive solutions and more value to customers and enabling technology partners to take advantage of Juniper’s open APIs. Together, Juniper and Aruba address mobility market trends with product-level integration that leverages open protocols and open APIs on Juniper routers and switches, and contextual data on users, devices, applications and location available from Aruba’s enterprise Wireless LAN (WLAN) products. With this new integration, enterprises will now be able to optimize application performance, enable mobility-centric security and policy, and reduce total cost of ownership by eliminating vendor lock-in. Already a partner with Juniper Networks for many years, Great Lakes Computer has chosen to align with Juniper in their positioning with Aruba Networks. This partnership will allow GLC to provide the knowledge, products, and expertise of Aruba Networks, as well as the new developments that their partnership with Juniper Networks brings. Great Lakes Computer already provides wireless site surveys to help improve existing wireless deployments as well as identify access point placement and coverage for new wireless deployments. These surveys help identify issues such as gaps in coverage, insufficient data throughput, service interruptions, and a growing number of devices. Great Lakes Computer will carry the complete Aruba Networks wireless portfolio including access points, controllers, and software, as well as provide professional services to support hardware sales. As the industry’s fastest-growing multi-environment disaster recovery and data protection company, Unitrends has recently announced the release of their online Business Continuity/Disaster Recovery (BC/DR) Link service tool that allows users to build and customize a disaster recovery plan. This enables users to easily build a comprehensive disaster recovery plan and confidently respond to an outage or disaster and recover systems quickly and efficiently. Unitrends has made this online tool absolutely free providing businesses that don’t have the staff, time, or budget to address disaster recovery with an easy and automated way to do so. The BC/DR Links delivers step-by-step guidance for building a robust disaster recovery plan and includes 1 Gigabyte of centralized storage in the Unitrends cloud. Businesses can use the cloud to store essential data such as evacuation plans and emergency contacts. In the event of an outage or disaster, users can access the data remotely from a computer or mobile device. According to a 2014 Preparedness Benchmark Survey conducted by the Disaster Recovery Preparedness Council, more than 60 percent of respondents do not have a fully documented disaster recovery plan. Unitrends BC/RD Link is an industry-first, saving companies countless hours and thousands of dollars for those that fall within that 60 percent. Build BC/DR plan with the best practices in mind while incorporating the latest business continuity disaster recovery methods, offers guidance through the process, and offers plenty of room to attach instructions, checklists, and floor plans. Allows the opportunity to connect the right people by giving everyone DR instructions remotely to spring into action as a well -coordinated team in the event of an outage or disaster. Securely links key people to the DR plan from any mobile device with the use of mobile checklists. Businesses can leverage Unitrends’ new hybrid cloud Disaster Recovery as a Service (DRaaS) offering if they are looking for increased storage in the cloud and white glove disaster recovery service. Unitrends’ DRaaS utilizes the company’s proven ReliableDR, Unitrends Enterprise Backup and Unitrends Bridge technologies and delivers recovery services for business continuity and protection of heterogeneous physical and virtual applications and infrastructure. One of the biggest issues in network security is securing web applications and sites. According to a 2014 Gartner study, 70% of ALL threats are at the Web Application Layer. In the past, traditional stateful firewalls and signature-based Intrusion Prevention Systems (IPS)/ Intrusion Detection Systems (IDS) were the primary means of protecting your network-based applications. Today’s Next-Generation Firewalls (NGFW) attempt to improve on those protection mechanisms by adding Layer 7 Application Firewalling, Content Filtering, and enhancements to IPS / IDS. Even adding in a dedicated Web Application Firewall (WAF) does very little to prevent Web Application Attacks. Sure, the level of protection increases with each layer, but how much are you actually increasing the security level by building on a poor foundation? That “poor” foundation is based on a set of flawed premises. The biggest of these flaws is that IPS / WAF are signature-based. Signature-based protection is completely reactive when it comes to dealing with threats. The entire process for a signature to be published is time consuming, not to mention that the vulnerable system is exposed or taken offline until that process is complete. The fact is most IPS and WAF implementations are running in “monitor only” mode due to the high level of false positives. To avoid blocking legitimate users and potential clients, these devices might be configured to alert or simply log anything considered suspicious and nothing more. This leaves your web applications exposed and vulnerable. It also puts your security in a reactive state. Juniper’s WebApp Secure (JWAS) changes the game by being proactive in dealing with threats to web applications. The concept is simple - Intrusion Deception. Provide false information that a normal user is either not going to see or is going to ignore, but that an attacker can’t resist. The moment they act on that false information, the attackers are classified and finger-printed. From there, they can have various levels of counter-measures applied to them, up to and including blocking. JWAS deals with Bots and automated attacks as well by providing false information. The goal is to make hacking a site or application so time consuming and cost prohibitive that attackers will simply move on. Enter Juniper’s Spotlight Secure. Spotlight is an online repository of attackers that have been finger-printed and classified. JWAS uploads this information to Spotlight where other JWAS users can retrieve this information and automatically classify known attackers based on their fingerprint. So even if the attacker moves on to another site or web application, every JWAS implementation subscribing to Spotlight can proactively take action against them at their first connection to a protected system, up to and including implementing a “block” action immediately if configured. In conclusion, while firewalls, NGFWs, IPS and WAF offer protection against known threats and attacks, JWAS and Spotlight Secure take this to a whole new level of protection by proactively mitigating threats, both known and unknown, allowing security professionals to focus on other potential attack vectors. Security professionals can sleep at night knowing their web applications are protected and secured. VMware recently introduced vCloud Hybrid Service (vCHS), a secure, hybrid cloud service that supports third-party and new application development as well as existing workloads. Providing agility, compatibility, and ease of use, vCloud Hybrid Service allows users to extend their current data center into the public cloud while maintaining control. Built on the foundation of vSphere, vCHS allows users to leverage the same familiar interface, network settings and management tools they have onsite, and migrate virtual machines between their data center and VMware’s cloud infrastructure. With support for over 5000 applications and over 90 operating systems, vCloud Hybrid Service is a complete Infrastructure as a Service (IaaS) platform ideal for high-performance, production workloads, disaster recovery, new application development, and more. vCloud Hybrid Service allows users to leverage their existing tools for a full cloud experience. The Virtual Private Cloud is a logically isolated, fully private networking service that lets users scale up and down as demands change. Starting with 20 GB vRAM, 5 GHz vCPU, and 2 TB standard or SSD accelerated storage, The Virtual Private Cloud offering is a multi-tenant hybrid cloud solution that is cost-effective and delivers expandability, value and performance. The Virtual Private Cloud offering also offers 10 Mbps of internet bandwidth with bursts to 50 Mbps, and two public IP addresses. Ideal use cases for Virtual Private Cloud include applications that are non-critical and highly variable test and development workloads. As a single-tenant, private cloud instance, the Dedicated Cloud offering is physically isolated and is ideal for security and high compliance workloads, as well as mission-critical applications. The Dedicated Cloud starts with 120 GB vRAM and 30 GHz CPU, Dedicated Cloud starts at 6 TB standard or SSD accelerated storage with internet bandwidth of 50 Mbps with bursts to 1 Gbps and three public IP addresses. Dedicated Cloud also has the ability to allow demands to match the supply by growing and then scaling back down as needed. With recovery as a service, the Disaster Recovery Cloud offers a minimum size of 20 GB vRAM and 10 GHz vCPU and contains 1 TB of standard storage. Offering 10 Mbps of internet bandwidth and two IP addresses, the Disaster Recovery Cloud is logically isolated and delivers native cloud-based disaster recovery capabilities for VMware vSphere virtual environments. By protecting on-premises cloud infrastructures through self-service recovery options, Disaster Recovery Cloud also provides automated failover testing, planned migrations, and recovery. vCloud Hybrid Service allows users to build new environments in the cloud or expand existing clouds when necessary. Some key features include broadest operating system and application support, high-performance, security and compliance, seamless network integration, manageability and reliability, lower cost of ownership and low risk, and a comprehensive ecosystem and best-in-class support. Some optional features of vCHS include data protection, direct connect, offline data transfer and application catalog. As many enterprises are looking to move into cloud-based solutions, vCloud Hybrid Service is an ideal solution for those already employing virtualization in their existing infrastructure. vCloud Hybrid Service enables you to extend your private infrastructure seamlessly into the cloud, resulting in improved efficiencies, coverage, and cost-savings. At Great Lakes Computer (GLC), we provide datacenter solutions. Our focus is in providing better technology at a great value, so it’s important for us to believe in the technology that we sell. This made it especially difficult when we were internally challenged with an inefficient virtual desktop infrastructure (VDI). Due to performance issues such as inadequate data capture and retention, high datastore latency, and long backup durations, our sales staff experienced productivity loss while waiting for programs and documents to load. This also affected our overall customer experience because information was not readily available for engineers and sales staff during phone consultations. As a result, our sales staff was unexcited to sell VDI to our customers because their personal experience with a VDI environment was negative. Our sales staff wasn’t alone in their complaints - our internal IT staff wasn't happy either. They were unable to virtualize SQL databases and Exchange mail servers and our backup processes were not being completed during the scheduled timeframes. To fix this issue, our internal IT staff sat down with the engineering staff and crafted a solution that would provide the performance required immediately with the ability to scale-up for future needs. The biggest factor affecting our VDI performance was an HP EVA 8000 storage array. Having already expanded the EVA 8000 as far as possible, it was clear that we needed a new array. We evaluated several different storage vendors, focusing on how well each array performed as a VDI solution. When evaluating compatibility and optimization regarding VDI, Nimble Storage came out the clear winner. Having recently become a Nimble Storage authorized reseller, our sales staff was thrilled that our IT and engineers’ evaluation supported our decision to adopt Nimble Storage’s line of products. Our IT and engineers worked together to install a Nimble Storage CS440G array for the storage backend of the server and desktop virtual machines. The implementation of the Nimble Storage array had an immediate impact on our virtual desktop environment. Workforce productivity has improved due to the greatly increased responsiveness of virtual desktops and server actions. The Nimble Storage array also reduced the duration to complete backups by 35% while also improving datastore latency. Consolidating the storage from a 42U rack enclosure and half of another rack enclosure into a single 3U array caused a noticeable reduction in power consumption and heat generated. The upgrade of the aging infrastructure to support the Nimble Storage SAN solution enabled the array to perform optimally. The full implementation of the end-to-end solution including storage, switching infrastructure, servers, and virtualization software that future-proofed our data center to scale as we continue to grow and virtualize our business critical applications. When our staff members were surveyed regarding their experience with the new virtual desktop environment, one account manager stated, “I don’t spend time with a locked-up VM anymore, allowing me to spend my time more effectively and be more responsive to my customers’ needs.” We’re happy to say our sales staff is now excited to talk about VDI, and especially the benefits that Nimble Storage can provide for a VDI environment. Backups – Are You Using Tape, Disk, or the Cloud? In a recent survey conducted by Nimble Storage, they asked more than 1,600 IT professionals to share their thoughts and concerns on data protection. The majority reported that they believe businesses need to protect the bulk of their data (which is increasingly generated by virtualized applications), protect the data often (minimum of every six hours) and recover data quickly (in at least six hours). It’s clear to see that most agree that data protection is a necessity, but with many options available such as tape, disk and cloud, what media are most using? Tape data storage is far from becoming the storage of the past, according to survey respondents. Results stated that half of respondents still use tape; 59% of large businesses and 32% small businesses surveyed still use tape media for backup. With large sized businesses usually having a well-established data protection infrastructure and process with longer compliance and retention requirements, tape is hard to beat in terms of cost. Although tape is still relevant, it adds complexity to the storage environment and is difficult to manage. Tape storage is also secure, safely moving private data offline to protect it from potential threats, breaches and viruses. For enterprises that need to store archived data, tape storage is ideal because the average lifespan can exceed twenty years, providing great longevity. Those surveyed reported that they believe other media types will begin to take over the tape market share, with only 13% of large businesses thinking that tape will grow. Either way, it will still be some time before tape is a thing of the past. Regardless of business size, the vast majority use disks for their data protection needs. Roughly 70% of respondents stated that they use general disk-based storage including general purpose storage arrays for data protection. Disk-based storage eliminates many of the downfalls tape storage has including cost, easy management, and fast recovery times. With these features being a key need in businesses today, it’s easy to see why disk storage wins the popularity contest. Backup appliances based on disk are storage appliances whose sole target is data protection and usually have built-in data management technologies such as compression and deduplication. Of those surveyed, 49% use backup appliances and of those 57% were of large businesses, 36% small businesses. Disk use and growth is expected to remain dominant in data protection (with general disk outpacing backup appliances) and 54% of respondents from large enterprises predicting that disk will outgrow and surpass all other media types. Cloud storage works well for some data protection needs such as archiving and long term backup, but it is not so well suited for aggressive data protection. Enterprise-level cloud storage allows data to be stored in virtualized pools and is typically hosted by third party companies. Here, businesses can lease or buy extra storage space that is required from a hosting company and typically only pay for what they use. Businesses are using the cloud for data protection today with 54% of small businesses and 28% of large business reported from survey respondents. Small businesses are attracted to the cloud because it allows them to skip the investment of another storage silo for data protection, and use a pay-as-you-go model. Due to issues such as compliance, security, and service level agreements, cloud storage can be ill-suited for large businesses. Of those surveyed, 56% expected a growth in usage of cloud storage for data protection. This perspective leans towards the assumption that cloud services are replacing use cases that were previously the domain of tape. Other advantages of cloud storage include the choice of on or offsite storage options and users are provided with immediate access. From the survey results, we can conclude that disk-based storage dominates data protection today and is expected to in the future, tape storage continues to grow slowly, and over time more businesses will transition to cloud storage. While the need for aggressive data protection will never go away, we will continue to evolve the way we store, back up, and manage data as new and improved methods become available. Businesses of all sizes receive benefits from virtualizing Tier 1 applications such as resource allocation, high availability, workload customization, and mobility. Although great benefits are provided, virtualizing Tier 1 application workloads also brings challenges that are associated with disaster recovery, management of the virtual infrastructure, and data protection. Veeam has extensive experiencing helping enable virtualization of Tier 1 applications for today’s businesses that demand constant access to data, efficient management of exploding data growth, and minimal downtime though backup, monitoring, replication, and management of the virtual machines (VMs). Veeam added Veeam Explorer for Microsoft Exchange to Veeam Backup & Replication almost two years ago. This provided access inside the Exchange .EDB database file from within the Veeam backup file, allowing granular recovery of items from an Exchange database to a running Exchange server in minutes instead of hours, all without agents. Veeam Backup & Replication v8 introduces additional features for Veeam Explorer for Microsoft Exchange including a web-based restore portal for help desk operators and the ability to recover hard deleted items. Veeam Explorer for Microsoft SharePoint soon followed and made it possible to restore and backup everything in a SharePoint environment. This allowed the .MDF database to be available from within the backup file with item level granular recovery features to the running SharePoint servers without the need for software agents. With v8 of Backup & Replication, Veeam introduces Veeam Explorer for SQL and Veeam Explorer for Active Directory. Veeam Explorer for SQL allows fast, transaction-level recovery of SQL databases in an easy-to-use interface. With a 1-Click restore back to the original location, digging through a file-level system or knowing where the database or log files are located are no longer an issue. Veeam Explorer for SQL provides agentless transaction log backup and restore that allows users to restore SQL databases to a specific point in time while ensuring low recovery point and recovery time objectives (RTOs and RPOs). Item-level recovery is made simple with Veeam Explorer for Active Directory. This allows users to easily recover individual Active Directory objects, computer passwords, individual user accounts, entire containers and organizational units instantly. Accessing and recovering accidental deletions or service accounts that need the password changed on every server that used that account is made easy with Veeam Explorer for Microsoft Active Directory. There is no need to extract the entire VM, perform or restore into isolation, or install an agent on the domain control. With these additions and upgrades to Veeam Explorer for Microsoft Exchange, Veeam Explorer for Microsoft SQL, and Veeam Explorer for Active Directory, Veeam continues to deliver the tools necessary to manage virtualized Tier-1 applications. All Veeam Explorers will be included in Veeam Backup & Replication v8, aimed for release in the second half of 2014.